Verna Joki’s Lifelong Brittled Saliva Waste is an installation about the conventional urban environment. It assembles digital photo-based drawings on fabric, a poem, a paving stone, and a piece of chewing gum. In her artistic work, Joki wishes to question the human-oriented worldview. Joki is interested in the city environment and its power structures. Could glimpses into the varied lives of organisms, which share the city with humans, expand the narrow perspective of man? How can we regard the temporal and material experiential layers that surpass human activity? 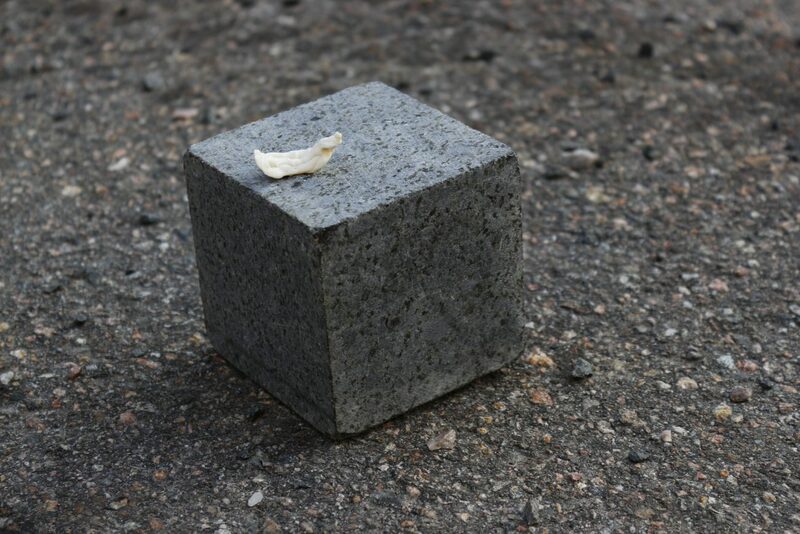 A piece of chewing gum on a paving stone works as a key to unlocking the thematics within Joki’s installation. Serial production and standardised manufacturing elements characterise modern construction. The contiguous presence of industrial output, natural transformations, and living organisms in the city bond with the eaten chewing gum. It’s linked especially to time—an imprint and trace to the past. In turn, the gum represents the superficiality of our consumer culture that’s based on non-degradable yet flimsy plastic materials. The photograph acts as a starting point to Joki’s body of work, which she then develops further by interweaving digital drawing. One part of the photo remains visible—occasionally certain forms linger, or only the colour scheme lasts, and sometimes the photo works as a framework for the drawn components. What emerges are hairy rotting carcasses, nest burrows and hideouts, sparkling sweat droplets, rank dewy breath, chalkly streams gathered in a flesh-like manner, a crisp, sun-dried, lizard, and chewing gum atop a paving stone—Joki’s images are born in a process where her thoughts emanate from lingered city steps. Verna Joki (b.1988) is an artist residing in Helsinki. She is finalising her Master studies at the Fine Arts Academy in the University of Arts Helsinki. In 2018, Joki was awarded the Aïda Alliman grant from the Vermeriaana Foundation. Her works are part of the State’s art collection. She has exhibited in several solo and group shows—most recently in Galleria Lapinlahti (2018) and Galleria Rantakasarmi (2018). In June 2019, her works will be on display at Galleria Rajatila in Tampere.